I honestly can not believe I am actually writing this post. To start with I can't believe that I will be a Mam to 3 children by July/August. I always wanted one last baby but not until Mia and Elliw were full time school and until I got a job (other than blogging). But it's happened and my partner and I have gotten used to the fact that we are now expecting another bundle of joy and we are really excited and so happy. It was totally different to my other two pregnancies. I was due on my period 1st November 2015 but (of course) I hadn't come on. I took a home pregnancy test a day or two later and they were both negative. I was feeling very tired and nauseous. So I went to buy a couple more tests and again, they were negative. I stupidly looked at Google and I took myself to doctors when I was 7 days late. He told me to come back the following week. I still felt nausea and tired so I went back at roughly 10 days late and I had some blood test taken. The following day I found out the blood test was also negative. It wasn't until I was 16 days late, still feeling extremely tired and nausea I just had a feeling. So I went to chemist and bought myself a single pregnancy test. I came home after picking Mia up from school and took the test. That is when the test came up positive. I just stood up in shock. I was shaking. I didn't know what to think. I was so confused because of all the other tests that turned out negative. Thankfully, one of my close friends went to chemist to get another test and came over (partner was at work). Again, a positive test! How was the first few weeks? If I am honest I have been feeling like utter cr*p the past few weeks. Most days I have been feeling ill and not myself most of the day, especially in the mornings, mid-day and evenings. I have been awfully fussy with my foods recently. I have been a bit hormonal but not much. The first few weeks were really nerve wrecking because I was getting a few pains and the doctor sent me for more blood tests to check my hormone levels, which then I had to go back another 3 times but the 3rd test showed my hormone levels were doubling which was good. Have you gone off anything? Food Cravings? I have really gone off tea! I can not stand the thought of drinking another cup of tea, even writing this is making my stomach turn! To think I used to have about 5-6 cups of tea before, I guess it is a good thing. I haven't eaten pasta in a long time and I used to love pasta. I went off pasta when I was pregnant with Mia too. I haven't got any food cravings yet really but I can only manage eat things I really fancy at the moment as I am very fussy! How did the first scan go? 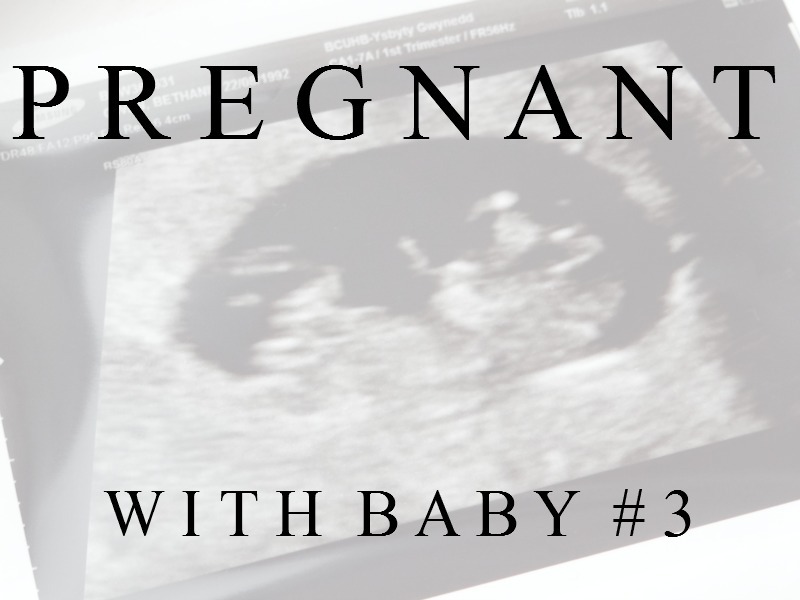 I had my first scan on 30th December 2015 at 11.20am. I was absolutely bursting for a toilet and started to feel really uncomfortable. Luckily I was called into the scan room just a few minutes later. I was really nervous but the next thing I could see a really wriggly baby on the screen. I was so happy, I couldn't stop looking and smiling. They confirmed that I was 10 weeks and 3 days pregnant and estimated due date is 24th July 2016. As I was only 10 weeks, they want me to go back when I am roughly 12 weeks so my next scan date is 18th January 2016 at the same time as my first. The only thing I am worried about is Obstetric Cholestasis coming back. I have already felt some itch in my hands and feet but we will see if it gets worse (which it probably will!). Are you going to do anything different this time? I haven't thought too much into it yet as I am still early but I do know that I am going to try my best to breastfeed this time round. I bottle fed Mia and Elliw so I would love experience breastfeeding this time. Congratulations! It's so strange that your tests were coming back negative, yet you weren't feeling good. I saw you instagram post announcing your pregnancy. It's such great news! Congratulations on ur lovely news such a special time. I hope u manage to enjoy ur pregnancy and lots of luk wirhur next scan. Congratulations!! I think my second pregnancy was my worst but my third wasn't that great either. Thankfully you sort of having to ignore most of it when you're running after the other two kids. Aw congratulations, that is amazing news for you. Isn't it strange that you had so many negatives but at least you know the cause of your symptoms now. Can't wait to read you journey.